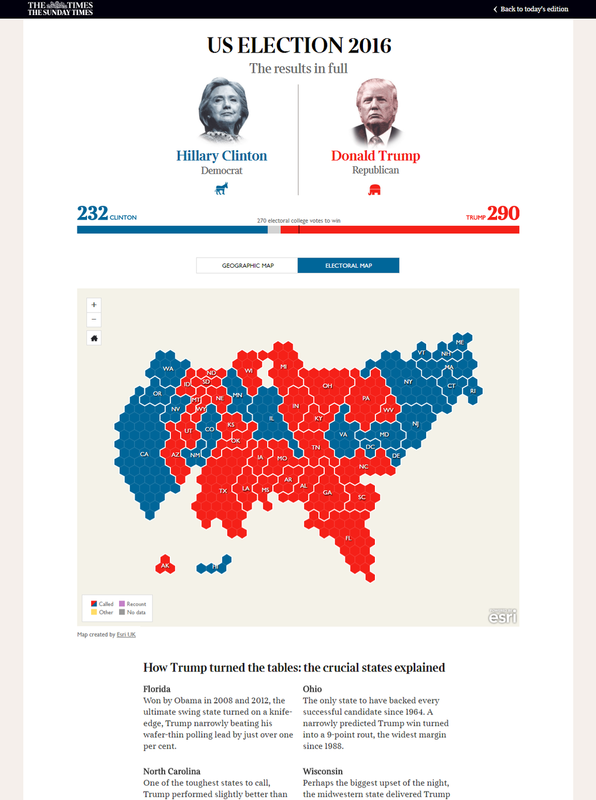 Building on the work for the Breixt referendum, when I was asked by The Times to support their US Presidential Election coverage, I knew we had to use a Cartogram. In US elections, Presidents are not chosen by a simple popular vote. Instead citizens vote for electors who are pledged to one of the candidates. This is known as the Electoral College. The College is made up of 538 electors who represent the United States. Each state is allocated a number of electors, based on the size of its population. California has the most with 55 — whereas Wyoming, which has a much smaller population, has only three. In almost every state, the winner of the popular vote takes all the Electoral College votes. The candidate who gains 270 votes wins the White House. For the cartogram I created 538 hexagons, one for each electoral college vote. I used a faint white line to divide the hexagons up and used a thicker, more dominant line to group the hexagons by state. This helped readers to understand how ‘electorally important’ each state was. In addition, I created a choropleth map using the Albers equal-area projection. A simple toggle allowed readers to switch between visualisation type. I’ve made the Shapefile for this map available as Open Data. Click here to download and create your own maps!